This fine piece of porcelain was made at the Imperial kilns of Jingdezhen in Jiangxi province, in the reign of Qianlong. Porcelain of this period, together with porcelain of the two earlier periods of Kangxi (1662-1722) and Yongzheng (1723-35), whether made for the enjoyment of the Court or for export, reflects a high standard of technical accomplishment that had been fostered by the renewal of Court control in the course of the reign of Kangxi. 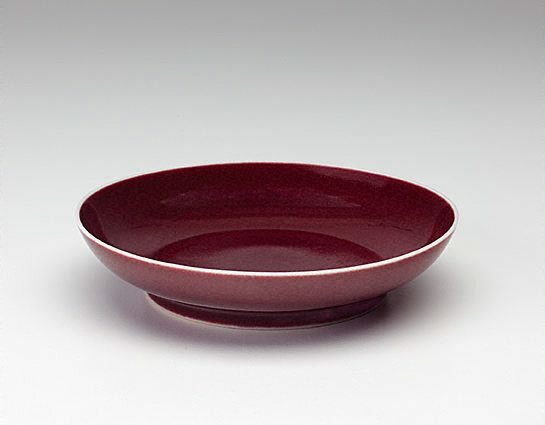 It was during the Kangxi period also that the enthusiasm for single colour glazes developed. The monochromes of the Qing dynasty are distinguished by their quality and variety. The most typical of the monochromes are the high fired copper reds. Asian Art Department, AGNSW, 1984.